Mix all ingredients in a mixing glass or steam pitcher, and pour over ice. (I like a nice big chunk, and have become especially fond of ice spheres made with simple freezer molds.) Twist orange peel over all and drop in. 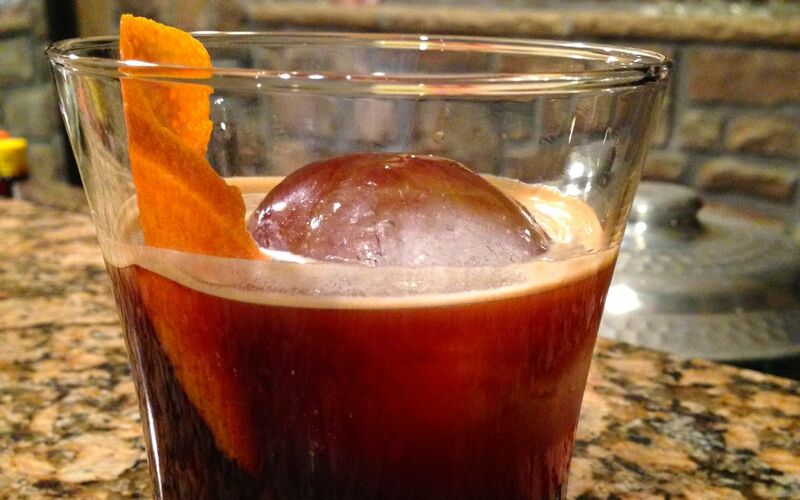 There’s lots of things to like in this drink — coffee two ways, of course, as well as the bitter orange qualities of Cointreau. You can use whatever triple sec you prefer: I like Cointreau’s crisp finish, though you may prefer the deep sweetness of Grand Marnier. And while I’ve long wanted to make my own coffee liqueur (largely to avoid the cloying sweetness of Kahlua) I haven’t gotten around to it yet, so there you are… another reason I choose Cointreau for this over Grand Marnier. On a dare I tried the same recipe garnished with bacon instead of orange peel. It was lovely, and wanted only eggs to be a complete breakfast. How about using a drop of Metaxa instead of the orange flavored liqueur? There is just a hint of sweetness, and there is no orange flavor. I like the way you think, Dorian.